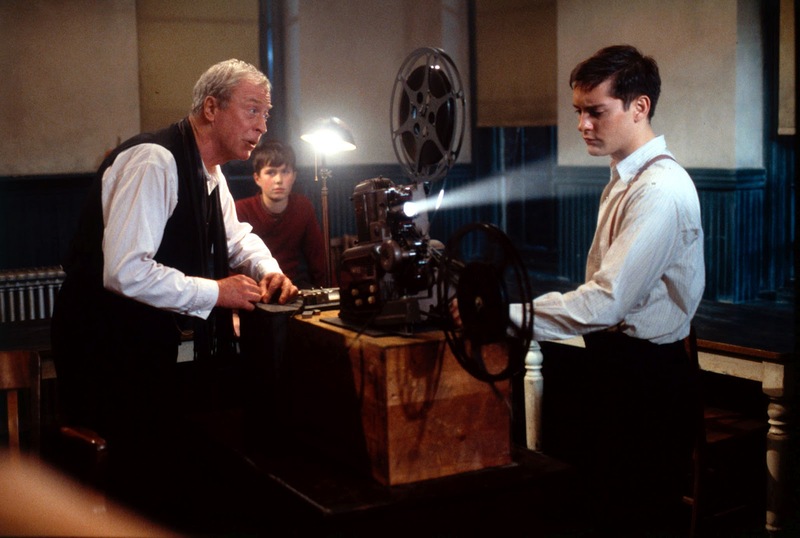 A feel-good drama about an orphan who strikes out on his own to discover the world, The Cider House Rules is sweet enough but also conspicuously contrived. Near an isolated New England rail station, the kind Dr. Wilbur Larch (Michael Caine) runs the St. Cloud's orphanage, nestled in the snowy mountains. Parents arrive to deliver and drop-off their unwanted babies, while other young couples also know that Dr. Larch performs illegal but safe abortions. Only rarely do some well-off parents arrive to adopt one of the orphans. Homer Wells (Tobey Maguire) is an orphan who was twice adopted but twice returned to St. Cloud's, once for being too quiet and the second time after suffering abuse. Dr. Larch raises Homer like a son, and despite lacking any formal education the young man becomes Dr. Larch's second in command, delivering babies and helping to run the orphanage. But Homer always refuses to perform abortions. With World War Two raging, air force pilot Lt. Wally Worthington (Paul Rudd) and his girlfriend Candy Kendall (Charlize Theron) arrive at St. Cloud's for an abortion. Finally restless and determined to see the world, Homer hitches a ride with the couple out of St. Cloud's, breaking Dr. Larch's heart. At the orchard operated by Wally's parents, Homer joins the apple-picking crew led by the domineering Arthur Rose (Delroy Lindo) and his daughter Rose Rose (Erykah Badu). When Wally rejoins the war, Homer starts an affair with Candy and maintains an uneasy correspondence with Dr. Larch. Despite being new to the outside world, Homer will soon face an unexpected crisis that will force him to define his destiny. An adaptation of a John Irving novel directed by Lasse Hallström, The Cider House Rules is a contemplative, amiable and pretty film. It also almost mechanically lines up and ticks off elements required to create a wistful coming-of-age tale. A picturesque mountainside orphanage, a kind-hearted curator, sympathetic nurses, amiable and ridiculously cutesy orphans, a surrogate father-son relationship, a stunningly beautiful girl-next-door as the love interest, and finally a perfectly placed moral dilemma for Homer to grapple with, bringing into sharp relief life's messy choices. There is nothing at all wrong with anything that the film does; it's all just too tidy, an adult fairy tale manufactured, designed and executed to tug at the hearts of Academy Award voters. Homer's journey of discovery is gentle and features a familiar tension between the comforts of home, in this case the orphanage where he is adored, and the mysteries of the greater world. Adventurous pilots like Wally and beautiful lovers like Candy await on the outside, but Wally will learn that there is no escaping difficult decisions. All that Dr. Larch taught him will come in handy when Wally stumbles into a crisis involving Mr. Rose and his daughter. Wally needs to define himself as a man responsible for justifying his own actions, and once he does, the world will look different. The titular cider house rules are instructions of conduct posted in small print within the cabin housing the apple picking crew, a place occupied by people who cannot read until Homer joins the pickers. The rules are another rather heavy handed example of the film screaming out its intentions to question societal standards, and examine the value of normative expectations when transported to unique contexts. Michael Caine almost single handedly raises the film towards the top of St. Cloud's mountain. 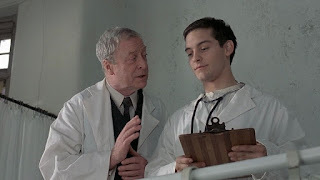 Dr. Larch is a remarkable character, having created his own rules of morality suitable for an orphanage filled with unwanted children, and Caine does the most with it. He turns the good doctor into a man who would enliven any dinner party with his straightforward thoughts about life, death and all the choices in between, although it seems clear that Larch would never leave St. Cloud's, and indeed may have lived his entire life there. In contrast Tobey Maguire sleepwalks through the film with his singular goofy expression, somewhat suitable for an orphan discovering the world but ultimately most tiresome in his inability to emote. He is overshadowed in the film's second half by the daunting Delroy Lindo as Mr. Rose, delivering a performance that speaks to all that life offers in the way of wisdom gained and dark secrets gathered. Charlize Theron and Paul Rudd are good but quite obvious, with Rudd's character summarily shipped off to war in another convenient plot device to clear the road for the sexual awakening portion of Homer's journey. Small roles are afforded to Jane Alexander and Kathy Baker as nurses, Kate Nelligan as Wally's mom, and J.K. Simmons as Candy's lobster fisherman dad. The Cider House Rules may harbour intentions of a complex fizzy drink. Instead, it's an average but still refreshing glass of plain apple juice.